Just like many other homeowners, you might be thinking about adding a deck to your house. There are many issues involved in taking on such a project; therefore, before you begin the building project, you need to decide whether you are the one going to do the job or whether you are going to hire a professional licensed contractor. Let us help you decide which route you should take by asking you the right questions and giving you some advice to help you with your planning. We would like to caution you, at this point, that one of the biggest things to research with a major building project in your yard is compliance to codes, HOA rules, permits and identifying buried utility lines by calling 811. The addition of a deck to your home is a great way to expand your living area at a modest cost per square foot. Let’s look at a building cost comparison to help you decide whether to move forward with a deck project or not. The “Cost vs. Value Report” from “Remodeling” magazine says that the national average cost to have a basic, all pressure-treated wood deck professionally built is $31 per square foot. If you compare that to the national average cost for a two-story addition to your home of about $210 per square foot, adding an outdoor living space becomes very attractive. However, the $31 per square foot quoted above is only a reference point. That figure can vary greatly according to how much DIY work you are willing to do and how simple or complex your deck design is. Another factor that helps you to determine whether to do the deck yourself is its size. 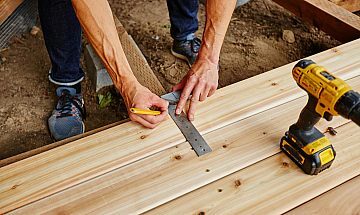 Smaller decks cut down not only on the amount of decking you’ll use, but also the number of posts, piers, joists, screws, and metal connectors that you will need to put in the right places. They also take less time to build, which will be a factor in determining which course is right for you to follow. A square or rectangle deck is straightforward. But, when you start adding curves, multiple levels, and herringbone decking patterns, you can tack on another 30% to 50% onto your costs, not counting the time and energy you would have to put into figuring out how to get the more complex design accomplished if you decided to do it yourself. While a competent DIYer is likely to cut that $31-per-square-foot cost in half, there is always the tradeoff in time — if you’re not building decks for a living, you are likely to take three times longer to build your deck than a pro would take. On the other hand, enlisting a few helping hands can make a do-it-yourself deck project successful without hiring a pro, but it will depend on the complexity of the job. You may want to have a multi-layered deck with a built-in jacuzzi and an additional retaining wall or a fence to add privacy. But, whatever you hope to accomplish with your outdoor living area, the do-it-yourself versus hiring a contractor decision comes down to time, money and skill as well as the additional items listed in the following questions. Taking on a major deck job can be an expensive project, but you can minimize your costs by doing the job yourself. Let’s find out if you are up to the task or if you should hire a professional contractor. Do you have a Plan for your Project? You should always put any project plan into writing. By doing so, it helps you to clarify the details and reduces your chances of forgetting something such as needed materials, design, etc. While plans for large projects can be extensive, a plan for a small deck project can take up only a few lines on a piece of paper and a small pencil-sketched illustration. However, the success of your project depends on how clear and accurate your plan is and on whether you think it can be accomplished in the way that you want to do it. Considering your past experience with your own skills and motivation will make it easier to decide on which way to go when implementing your plan. Remember that often the pressure to get fast results encourages people to skip the planning phase and get right to the job without considering the best way to implement the building process. Although this strategy may create a lot of immediate activity, it can also create significant chances for waste and mistakes. Do you have the time for such a project? Time is one of the most important factors in anything that we do in life; and when taking on a building project, this is the first thing that you should consider before you decide to take on the task yourself. Doing any type of renovation or significant home repair can take a big block of time (that you may not have) out of your schedule. Be honest with yourself about the time you can devote to your project. Can you knock this job out fairly quickly in your spare time or over the weekends or can you miss work to get it done? In addition to these time factors is the issue of unexpected events such as waiting for materials or handling issues that come up once you start your building project. In taking on a building project such as adding a deck, time delays can be a real challenge. Add to this the fact that by doing it yourself you might be blocking an entrance or exit for a longer duration than you initially thought was possible. This is especially true if you hit a snag in the workflow. Therefore, before you commit to doing any building project yourself, you should be realistic about how much time the work will take and whether you have the ability and desire to invest this time. If you have any doubts about having the necessary time to bring a project to completion, don’t start it yourself. We recommend that you know in advance how much time you are willing to put into your DIY deck project before starting it. Do you have the skills required to take on a major project? It is important that you do a mental assessment of your own skills and abilities. Even though many of the home improvement products that are available today are designed to make it easy for do-it-yourselfers, some projects will ultimately require specialized skills. Even if you have a basic knowledge of building principles, some projects may still go beyond anything that you might be able to accomplish without a professional. Intricate decks with different layers and steps will require specific plans that need to be followed to successfully complete the job. If the different layers and steps are not secured properly or are not attached to the right place, the job can become a disaster. Watching a pro on a home renovation show is not the same as having a practical knowledge and experience in building. If you get in over your head, it can end up costing you more and causing you more frustration than if you had hired a professional to do the job for you in the first place. On this point, we recommend that you make certain you have the proper skills (or can learn quickly enough) to bring your project to a conclusion if you start it as a DIY project. Do you have the tools and manpower for your project? Even if you have the time to take on a building project, it might still be more cost effective to hire professionals because they may have the tools and manpower to do the job quickly and correctly that you may not possess. If it is necessary for you to lay out the money just to get the basic tools required to build a deck yourself and must pay people to help you or beg for someone’s help, you might be better off securing a pro to do the job for you. For one thing, a lack of basic tools is oftentimes an indication of a lack of motivation to build or repair things or a lack of any real knowledge in the area of building. If you are lacking the necessary tools and needed manpower, a project may even end up costing you more in the long run by doing it yourself. We recommend that you make sure you have the necessary tools and the help that you need before you tackle a DIY deck. Some of the boards can be very long and heavy and might require more than one person to put them in place. Do you have a way to store and transport your tools and materials? Lumber for a decking job can take up lots of space; and you don’t want to just throw it down just anywhere, so you need a place to safely store your lumber and other materials until you use them. You also need to assess if you have the transportation and time needed to make trips to the store to pick up your building supplies. Homeowners tend to forget things that experienced professionals are used to taking into consideration. If you don’t have a way to store or transport your tools or building materials, you may want to hire a contractor who can pick up the materials and who can take their tools with them at the end of the day. However, if transportation is your only issue, you can use the delivery services of your home improvement store or lumber yard. Check with them first to see how long your wait will be before they can deliver your lumber and other materials to you. How does your funding look? Money, or more correctly a lack of it, is the usual motivation for someone tackling a do-it-yourself job. While there is a certain satisfaction in being able to do small things for yourself such as wiring in a ceiling fan or replacing a door, most do-it-yourselfers would contract out a building project if they had the funds to do so. We recommend that if you have the money, and the project is bigger or more complex than you like to tackle, consider hiring a professional contractor. Have you made a budget for the project? There is some good news about establishing your deck budget. That is that there are many free deck cost estimators available online. You just need to put in your dimensions, choose your materials and add your zip code. The deck cost estimator will then give you a good idea what your deck will cost in your area. You can generally find these deck cost estimators on the websites of deck part manufacturers and home improvement centers. Some of them even have deck stair calculators too. Using a cost generator is a great way to kick off your project with a budget firmly in hand. Using your budget is one of the best ways to determine whether you should do a job yourself or to hire a professional. An alternate way to create a budget is to list the prices for all the materials you need, including nails and screws, paint and stain, cement mix and whatever other little incidentals the job might require. It is suggested that you then add about 10% to that cost for everything that you might run out of or might have forgotten. (This should give you a pretty good idea of the real cost of your DIY deck). While the cost generator gives you a pretty good idea of what your budget should be, an itemized list plus the 10% may at times be more accurate for a DIY project. We recommend that you compare your DIY budget with a quote from a licensed contractor when deciding whether you want to tackle the job yourself or hire a pro. Is the rest of your household on board with your project? Even though you might be a great do-it-yourselfer, it will do you no good to start a deck project if the other members of your household don’t share your enthusiasm for the project. This is because nothing can undermine any project faster than having your family at odds with you over it because it disrupts their normal routine, or they don’t want to lend a helping hand when needed. Therefore, we recommend that you talk it through with everyone in the household ahead of time to make sure that your family stands behind you in your project. Do you have a deadline that you are working towards? If you have a specific deadline that you are working towards, you need to set a realistic timeline to determine if you can meet your goal. If you want to get your deck done before the summer season gets into full swing and you are working overtime just before summer, it’s not very probable that you will be able to finish your deck in time by doing it yourself. If you hire a pro, you need to make sure to discuss your deadline with them at your very first meeting to see if they can meet your timeline. Moreover, if you hire them to do the work for you, be prepared for them so they can get started right away. It is also advisable to ask your contractor if they will be working on any other clients’ projects at the same time they are working on yours. If they are, it could slow down your timeline considerably. Patience is essential when you are building anything, including an outdoor living space. Assess if you are easily frustrated or whether you are one who takes time to look at the plans and read directions. If you are a person who usually throws a manual away when you have barely started reading it, you might want to save yourself the headache of building your deck by hiring a pro. On the other hand, if you like the idea of a challenge and enjoy being a do-it-yourselfer, then building your own deck could be a rewarding experience for you. Are you ready if something goes wrong? This point goes hand in hand with the one above. There is no telling what problems you might face. Murphy’s law says that what can go wrong will go wrong. If anything does happen to go awry, would you know how to handle it? Even if you are building a deck yourself, it is best to have a couple of experts that you can call in case you need a second opinion or a helping hand. Are you ready to make some sacrifices? If you are not ready to work nights and weekends or miss social events or vacation time to get your project done, you are probably not going to finish it. You need to determine if your time or money is worth more before taking on building your own outdoor living space. Are you willing to let strangers in your house? Even though they are in your house to help you, strangers in and out of your house can disrupt your regular routine, not to mention dirty boots, sawdust from the deck, and the other things workers do that turn your house upside down. Managing a work crew coming in and out of your house can be a taxing proposition. Do not underestimate the imposition of several workers in and out of your house for a week or more. Be ready to change your personal habits to guard your personal privacy and that of your family. We recommend that you decide how much upheaval you can tolerate in your house before you hire a contractor rather than doing the job yourself. Do you mind dirt in your home? When any kind of remodeling or building is done, it seems like the project is always accompanied by a mess, whether it is in your yard or your house. Sometimes the mess is nothing more than the dirt being tracked in on your boots or the boots of your contractors. Rainy weather can compound the problem. Even if you are just rolling stain or water repellent on your deck or spraying it on railings, etc., there is still some sort of mess to clean up. If you can’t stand being dirty or want to minimize the mess you must personally clean up, we recommend that you hire a pro for the project and make it a stipulation in the contract that they are responsible for cleaning up the job site and that they try to maintain a clean work environment. Have you checked whether or not you need a building permit? In most places in the United States, particularly in the cities and suburbs, a building permit is required for any renovation that changes the structure of your home, and that includes adding a deck. The permit will typically be issued by the county, parish, town or city where the project is located; and the work will generally be inspected to make sure that it meets the local building codes. You can get a hefty fine if you don’t get the required permit, so we recommend that you get one when it is required. We would also like to remind you that someone looking at your home if you decide to sell it in the future, may ask about the building project and may want you to verify that the work was done to code. Have you gotten a second opinion or quote to make sure you are saving money? It is always wise to talk to a contractor before you make a final decision in a building project, especially if your primary reason for doing it yourself is to save money. Where you may lack the necessary skills or time to build your outside living space, an experienced contractor may be able to suggest ways of reducing your costs while still using the services of pros. If you are thinking about doing your deck project yourself, please go to the “Be a Savvy DIY’er” page for more helpful hints.